Long before I had my laptop I had a screen on the G5 in K's home office. And on that screen I had a folder. In that folder I had recipes, Oldest's resume, some photos and lists and lists and lists. Somehow the folder got lost. I searched and traced and did everything I could think of to track it down. BUT YESTERDAY, while he was re-organizing his work space, K checked a bunch of auxiliary hard-drives and FOUND IT. It had been gone for almost two years and I felt like I was seeing an old friend when it opened. A couple of years ago, J Crew sold a set of patches and ribbons. And while it seemed rather ridiculous and I can't remember what they were charging for some fabric and ribbon scraps, I was intrigued by the examples given of how to use them. This was one of the ways - I like it, I like the idea of gros grain ribbon peeking out from the frayed edges of jeans. Sadly, I don't wear jeans. 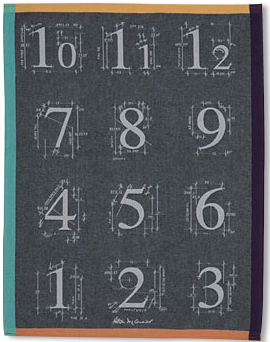 Quelobjet.com has the prettiest tea towels. Two of these would make nice curtains for my kitchen window. 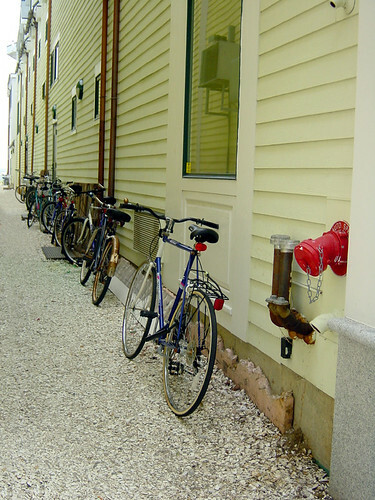 I love this alley...it's lined with crushed shells. this particular branch of Anthropologie does lots of wonderful things with these bottles. This is the invitation from Youngest's 9th birthday party. I used to make them with index cards and color copied photos and marker and glue! Now I'd just photoshop it all - if we still had parties. eat invitee got a big rubber ball in lieu of a goody bag. clever party invitations/thank you's. i like your party favor idea as well. original! Hey! 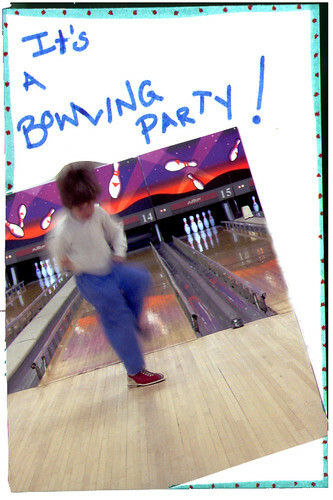 We went bowling on the girl child's 9th birthday! It must be a 9 thing. Ahh! Curses on you for pointing me to that cute Frenchy shopping site! 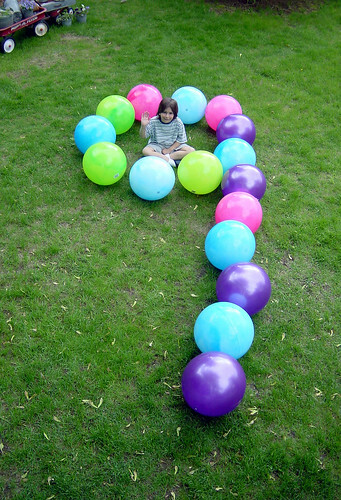 i love the pic with the 9 in balls. we did the balls-as-favors for Seg's second bday and it was SO much better than a bag 'o crap. this year we gave out little golden books (one for each child) for seg's party...i try to avoid the favor bag altogether. i love these random-photos-with-comments posts of yours. Now. .save it to a disk or something! sometimes there is no better feeling than something found. especially with cute pictures of youngest in there. So nice when the lost is found instead of the other way for a change! I took the same damn picture at Anthropologie, but I didn't get in trouble for taking it, probably because a) I look really mean and 2) Perfect Friend Terry was there to distract the floor staff. wait, you don't wear jeans? not that I want to diminish K's good job at cleaning, uh? tres cute. thank god for firewire hard drives, eh? I adore the picture of the jeans. I feel like I want to make a pair of jeans all torn like that just to have an excuse to...go to Joann's to buy some ribbon...oh forget it! But I love the picture. I don't think we have Anthropologie shops in Pittsburgh. But again, I love your pix. How did you and other BB get away without giving out lollies at birthday parties? We gave bags of (NICE) jewellery to the little girls one year and got cut from every birthday list for 12 months... Oh, wait, maybe I just answered my own question by saying "girls'?? i worked on that bottle display! no, we have to be hardasses unfortunately. now that i want to take pictures of things all the time for my blog and no one lets me, i feel your pain.